Now that my Chandail is done, I find myself again in that weird spot where there's no big project to work on. I'm still working on my cowl during my lunch breaks (and I'm in the home stretch as far as that's concerned -- roughly halfway through the last ruche -- so I should have it finished by this weekend) and I don't really feel like picking up my Breezy Cardigan again, so I decided it was time to go back to square one for any project: swatching. For starters, I had to swatch with some gorgeous Malabrigo Rios that I picked up at my LYS last weekend for another design project. The colorway is Sunset, which is a color I'm still not entirely sure I can pull off but that's been calling to me for several months now, so I finally gave in. I swatched with US 6's, which usually gives me about 5 stitches to the inch, but I wanted to be sure. I've never worked with this yarn before, and it is superwash, so I'll wait to see what it does after a dip in the water. Then there's the other swatch. The test for my sweater pattern is in full swing, but no one's signed up for the 32" size, so I thought I'd knit it myself (and, conveniently, it should fit my mother, so I'll have a gift for her when I'm done). For the yarn, I went into deep stash and pulled out some bright pink Cascade 220 that I bought from WEBS more than five years ago (I could dig through my archives to figure out when, but that would take a while -- I do know that I bought it back when we were living in the old townhouse, and we moved out of there almost five years ago). Knitting this up will have the double benefit of giving me an opportunity to double check my yardage estimate for the pattern and clearing another sweater's lot of yarn out of the stash. This should go a little faster than knitting the sweater in my size, as my mother's significantly smaller than I am and I've got the pattern all finalized this time around. It might also help to quash my desire to knit myself another sweater right away! I had hoped to get this done over the weekend, but I spent Sunday afternoon washing the last four loads of my Rambouillet fleece (had to get it done before work started on our basement project yesterday morning) and cooking two dinners. That meant I spent a lot of time running up and down the stairs and puttering in the kitchen and not so much time sitting with my sweater. Rainbow then proceeded to have a major meltdown at bedtime, so that meant I lost about half an hour of knitting time in the evening. Fortunately, there wasn't a whole lot left to be done. Last night I knit the last four rows of the collar, wove in all the ends, and sewed on the toggles. It got tossed into the bathtub for a soak and then laid out to dry just before I went to bed. I'm still a bit amazed at how quickly I finished this sweater, especially considering that (a) I didn't knit on it every day in the past three weeks (I took a couple of nights off for spinning) and (b) the Mister was gone for part of two weeks, meaning my knitting time at night was considerably shorter than usual. But I suppose when you're knitting a great pattern at a relatively large gauge with fabulous yarn, it does go by quickly! This is now the second of Triona's patterns that I've knit, and like the last one, it's knit seamlessly from the bottom up -- the body's knit flat, the sleeves are knit in the round, and then they're all joined on the needle to work the yoke. The cable pattern required just a bit of concentration (insofar as I had to count my rows/rounds every now and then), but I didn't need to refer to the pattern for the cables once I'd worked the first cabled row. This is definitely one of those patterns that looks a lot more complex than it is -- the cable is just two rope cables worked side by side. That meant that with the exception of some occasional counting or measuring, this sweater required very little attention, so I could just sit down and knit. I'm really very pleased with how this turned out, and it was truly a pleasure to knit. Tosh Vintage is so lovely to knit with -- it really has a lot of life to it, and I must admit that I started swatching with something else while the sweater was in the bath that felt truly dead and limp in comparison. As I said in the Madelinetosh Lovers knitalong thread, I think if I could knit with nothing else but Vintage for the rest of my life, I'd be perfectly content! *I don't consider myself an "old woman" yet, but the title comes from this poem. After two years in the Crown Mountain Farms fiber club, I decided to take a different path for 2013. I got into the Bee Mice Elf fiber club after being on the waiting list and decided to give it a try. This club lasts six months and has three shipments. The first arrived early this month and I was in love with it from the start. 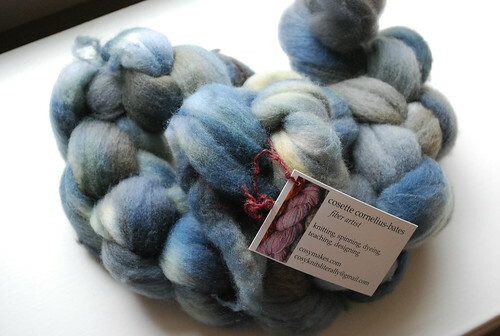 This shipment was Polwarth, my absolute favorite fiber to spin, in a colorway called Crewel World. Rather than going for the obvious and doing a chain ply to keep the color progression distinct, I decided to split the fiber in half and spin a fractal -- so I split the top in half vertically and then split one of the halves in half again. The effect is then that both plies move through the colors in the same order but one of the two moves through the sequence twice and the other moves through it once. 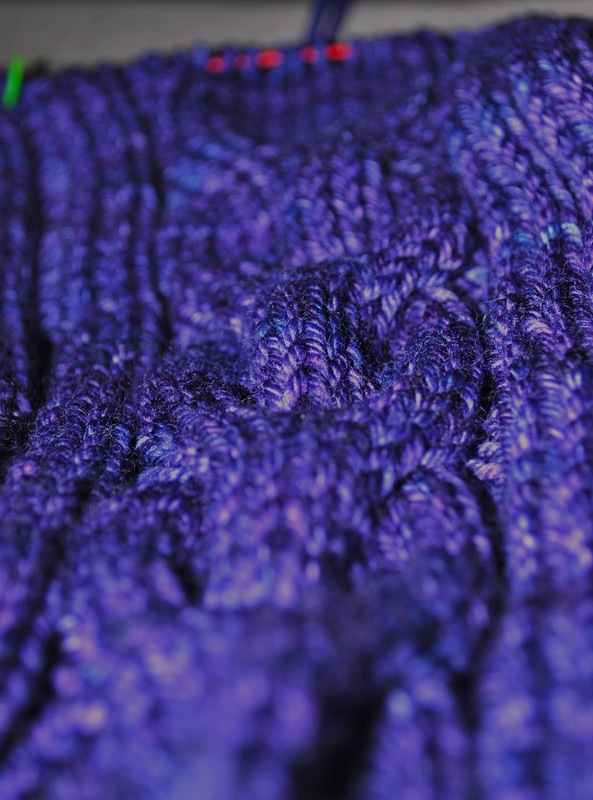 The finished yarn is a little toned down compared to the fiber, but it's just as beautiful. It's about DK weight and just shy of 200 yards. As usual, I have no immediate plans for this skein other than to admire it. And I'm okay with that! Thanks to those of you who left comments about Amberson. It was a rare treat to publish in that I knit the sample, graded and wrote the pattern, had it tech edited and test knit, and published it all in less than a month -- that's a really fast turnaround time in my book. Meanwhile, I'm still working on getting the sweater ready to publish; the sample, grading, pattern, and tech editing are done, so now I'm in the test knitting phase (and I still need a few more testers -- the testing thread is here, if you're interested). For now, I am focused on getting my Chandail done before the end of the month (and the end of the Madelinetosh Lovers knitalong). On Tuesday night, I was finally able to join the sleeves to the body and start on the yoke. I always think this section will be fast, but the truth is that until you've worked a bunch of decrease rows, these are some really long rows. That first night I managed only getting everything on the needles and maybe two rows in about an hour and a half. But now I'm to the point where the stitches around the arms are no longer tricky to move along the needle and I can see the yoke starting to come together. I did make one little booboo on the sleeves. I had intended to stop the cable pattern in the same place as I did on the body, but it turns out that I can't count. I thought I had done six rows after the cable crossing on the body, but it was actually seven rows. The cables are crossed every 10th row, and for knitting flat (as the body was and as the yoke is now), that's always on a right-side row. Unfortunately, because the sleeves were knit in the round up to the underarms, that meant that every 10th row would fall on a wrong-side row for the sleeves. I already had two ends to weave in at the top of each sleeve (because I was alternating skeins every two rounds) and didn't want to add in two more to add one more round -- I'd already cut the yarn -- so I just decided to do the cable crossing one row early on the sleeves for the first cable crossing after joining all the pieces. If you look closely and count rows, you'll see it, but I don't think it's very visible to the naked eye. Conceivably I could have crossed the cables on the arms on a WS row, but I didn't want to have to think that hard about it; it's much easier to cross all four cables in the yoke on the same RS row. There are some people I know who couldn't abide this particular design feature, but it's one I can live with. The goal is to try to get this done this weekend, perhaps in between washing the last four loads of fleece in the basement. We're about to install a French drain system down there, so I'd like to get it washed and out of the way before it gets even dirtier. There's also some yarn to ply, so expect to see some bright colors on Sunday! About a month ago, a skein of madelinetosh vintage followed me home from my LYS. I knew I needed a new hat (the Koolhaas I've been wearing for several years has really been showing its age), and I wanted to do something relatively simple to allow the yarn to shine. After I worked up the hat -- and ripped and reknit it once -- I realized that this would be a great design for men, women, kids, and babies, so I decided to write up the pattern. The result is the pattern I published today: Amberson. 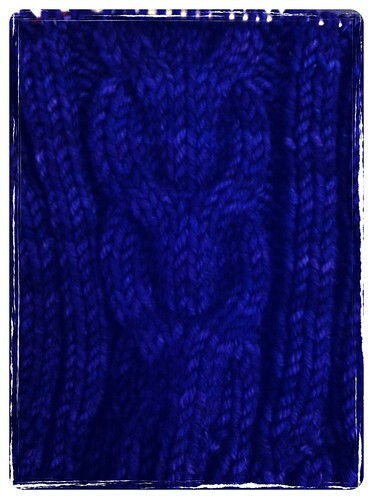 While at its heart this is a simple bottom-up beanie, the special feature of this hat is the four "ribs" that eventually meet at the top of the crown. These are achieved through slipped stitches that also conveniently hide the decreases. The hat is available in five sizes -- infant, toddler, child/teen, adult small, and adult large -- and even the largest size uses less than an average skein of worsted weight yarn, making it the perfect pattern for that one skein of impossible-to-get-more handpainted yarn that's been in your stash forever or even (if you're making one of the smaller sizes) leftovers from a sweater project. This hat has already become a favorite in my house (a certain toddler keeps stealing it from me! ), and I hope it will be in your house, too. Though I'd hoped to have a lot more sleeve done by now, this sweater just isn't progressing as fast as I'd like. I think the fact that a certain toddler has been slow to go to sleep all week (thus severely inhibiting my knitting time each night) has had something to do with it. In any case, I'm more than halfway through the first sleeve and have just one more set of increases to do to reach the target stitch count. In knitting this sleeve, I was reminded what a pain it is to alternate skeins of yarn when knitting in the round. When I was working on the body, I was working flat, so I was changing at the beginning of a row. Now I'm changing at a point that will end up being the middle of the sleeve part that's under my arm (does that make any sense?). While it's not hard to do and it's in an area where it really won't be seen much unless I choose to run around with my arms over my head, the stitches on either side of that spot a little wonky between yarn changes and increases. It should even out somewhat with blocking and wearing it, but it is annoying me nonetheless. I suppose it would annoy me more, though, to have sleeves that are clearly different colors, so I'll continue to alternate skeins and just live with it. In other project news, I've put my cowl on hold for the time being while I knit up a square I'm contributing to a blanket. I can't give any more details on the rare chance that the recipient might read this, but I expect that it shouldn't take more than a few day's worth of lunchtime knitting sessions. Once I do get back to work on the cowl, I expect it won't be too long before it's done. I was just about ready to start the second set of welts when I put it down, so I have maybe 30 rounds of knitting left to do. This weekend, after finishing up that last skein of handspun, I really put my nose to the grindstone on my Chandail. I spent Sunday afternoon washing up several more loads of fleece and got in two or three rows in between every change of the water. By Sunday night, I'd finished the body (hence the title of this post -- I now have the body, if you will). Last night, once I finally got Rainbow to sleep (the Mister is traveling for work this week, which means that both of us have difficulty falling asleep), I put the body stitches on waste yarn and cast on for sleeve number one. 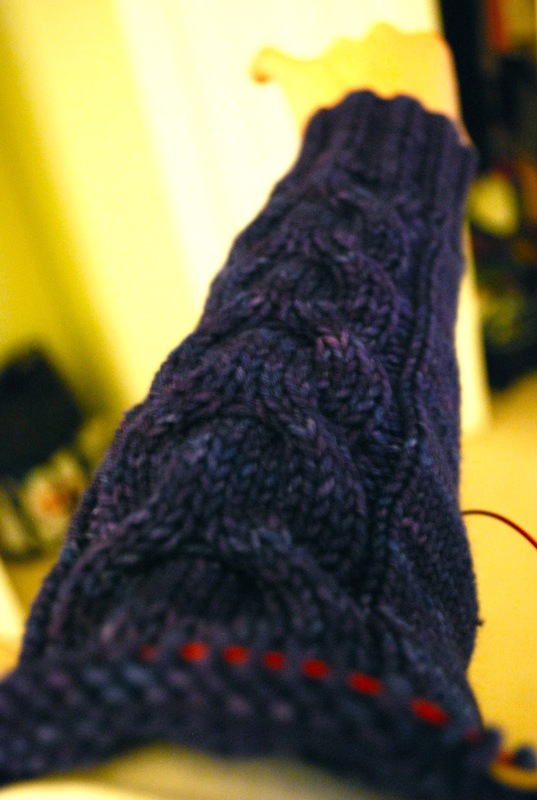 By the time I went to bed, I'd completed the 3.5 inches of ribbing on the cuff and started in on the cable pattern. The sleeves should go very quickly, or at least faster than the body. Of course, now we've reached the inevitable point in the sweater where I start to worry about my yarn supply. I had to join in the third and fourth skeins of yarn to finish the body (so it used a full two skeins), so I'm using the fifth and sixth for the arms -- and six is all I've got. I keep reminding myself that sleeves do not use nearly as much yarn as the body and that the last time I knit one of Triona's patterns I had plenty of yarn leftover. There's always the tactic of knitting faster so that I finish before my yarn runs out, too. I spun up each skein onto its own bobbin and then plied them together -- very little thinking or effort involved. I ended up with this fluffy, bouncy skein of two-ply worsted weight, approximately 350 yards in all. I love the finished yarn, and I love how easy it was to spin up. 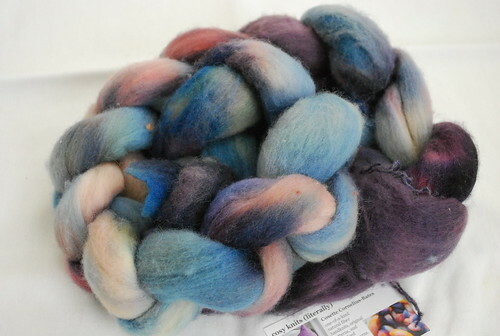 I'm planning something similar for the next fiber to go on the wheel, this gorgeous Polwarth from the Bee Mice Elf fiber club (this is my first shipment after I made it in off the waiting list last month). Isn't it spectacular? I'm going to spin it as a two-ply fractal so that the colors will still pop but blend just a bit. I've been trying really hard to work on my projects this week. Unfortunately, it's been another crazy week at work, compounded by a congested and cranky toddler, so finding the time has been difficult. I've been able to squeeze in a little time here and there, so my projects are moving forward albeit at a slow pace. My cowl is almost halfway done; I'm now into the second/middle ruche (though just barely). As you can see, I've joined the second skein of yarn, and I've discovered that this yarn felts quite nicely in a spit splice. These ruche rounds are really long -- it took me all of my lunch break to do about 3/4 of the increase round and part of a plain knit round -- but the nice thing is that it's very mindless knitting. I can easily fit in a round or two here and there. What I'm really trying to focus on, however, is my Chandail. I worked on it at knit night last night and got a couple of inches done at least. I'm ready to cross my cables again on my next row. This seems like it's taking a while, but I have to keep reminding myself that I'm working on the entire body right now, so when I finish it, I'll be done with a good portion of the sweater already. My goal is to try to get this done by the end of the month in order to qualify for the knitalong (and have at least a couple of chances to wear it before it's too warm). I have another sweater's worth of yarn in the closet patiently waiting for me when this is done, so it's time to get the needles moving! Over the weekend, I decided I needed another sweater. 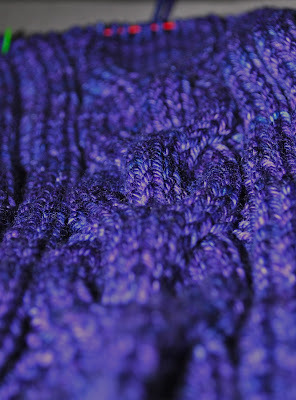 As it happened, I had a sweater's worth of madelinetosh vintage (which may very well be my new favorite yarn) in Iris in my closet that I picked up at my LYS's Black Friday sale. I had bought it specifically to knit Chandail, and as there's a stitch-a-long (knit and crochet) going on this month in the madelinetosh lovers group on Ravelry, I thought I'd play along. I am being good and alternating skeins, and it's knitting up beautifully already. The color is a little off here (it's really more of a royal purple than blue), but that's what you get when you take a photo at night and then play with Flickr's filters. I have completed the waist decreases and am now at the point where I work even for several inches before starting the increases. It's pretty mindless knitting, which is a good thing, because my brain has really been fried at the end of the day. As long as I remember to cross my cables every 10 rows, I'm good. I've also made a little progress on my cowl -- once I finished those long ruche rounds, it moved along at a much quicker pace. I'm in the middle of my second welt now, so about a third of the way done with the whole thing. I expect it to move slowly now that it's be relegated to lunchtime knitting, but I'm okay with that. In spite of the groundhog's prediction over the weekend, we've been having snow pretty regularly, and winter shows no signs of leaving anytime soon. After spinning up all that laceweight, I thought I should do something pretty thick and quick next. I had 8 oz. of Falkland top in my stash that I'd bought at different times from Cosy (4 oz. at a time). They weren't the same but had the same overall look to them, so I thought it would be fun to spin each batch of fiber up on its own bobbin and then ply them together (my miniSpinner bobbins can handle 8 oz., so I thought I'd take advantage of that). I started with this braid on Friday night. It was so pretty on the bobbin as it was in progress that it almost seemed a shame to ply it or even take it off. But as I only have four of these bobbins, it will be plied. I started on Friday night and was done with it by yesterday afternoon, thanks in no small part to the fact that my Downton Abbey season 3 DVD set arrived on Friday and had me glued to the laptop all evening. Last night I started in on the second braid of fiber. It's not nearly as colorful, but I think this more muted colorway will compliment the brighter colors in the other braid well. This braid, unfortunately, appears to not have been rinsed completely, so my hands were pretty black when I finished my spinning session last night. I estimate I'm about a third of the way done. If I can find the time this afternoon or tonight, I'll try to get as much done of what's left as I can. I think this afternoon is for washing fleece, though. We're planning on finishing our now unfinished basement in a month or two, so I've got to get the fleece clean!